Springtime is more than a season of new beginnings. For those completing high school, it’s the season of gowns, tassels, and warm cheese at graduation parties. As the class of 2016 leaves high school behind with literal ‘Pomp and Circumstance,’ college becomes the next new frontier. Things just got real, so to speak. The excitement of getting accepted to a university might be slowly replaced with fear of the unknown. After all, for many kids, this is the first time they’ve left home for a sustained period of time. They might not know anybody, and they’ve just said goodbye to the friends and classmates with whom their entire social circle has comprised of up to this point. This is the perfect time for the freshman student experience folks to kick in, and send the welcome kit. Glad you asked. A welcome kit is the introduction to the institution. It might be sent all at one time, like opening a giant, college-themed gift, or it adopt a more just-in-time model where accepted students learn more gradually, and at times which it makes sense to perform actions like completing the FAFSA, registering for classes, things like that. However, while the materials should be helpful and informative, they should also impart the core values of the institution. 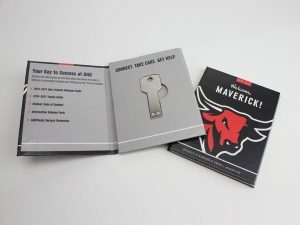 In this example (recently created for the University of Nebraska – Omaha), newly-accepted students received a small, pocket sized folder, welcoming them to the institution. Note that it identifies them as a student by associating them with the university’s mascot and iconic red and black. The die cut cavity inside is a key-shaped USB drive. On the USB drive are materials that might have formerly been printed out. A new student guide, checklist, things that previously cost the institution a pretty penny in paper, ink and postage, now condensed into a keepsake package. 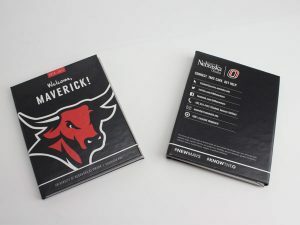 This folder kit not allows the institution to save money (and not a few trees in reducing paper), but also helps guide the new Maverick a bit more. By placing materials on the USB drive, you can highlight certain things digitally where, in paper, it wouldn’t be possible. As the incoming class are also digital natives, this way of accessing information is more natural to them. It also provides the institution the opportunity to share things with the student in a way that meets their preferred learning style: reading, listening, and/or watching. Some might feel like the tangible element of receiving a packet in the mail is lost, and that valuable real estate for information-sharing is cut down. I would counter that argument by looking at how Nebraska optimized the back of the folder kit with all the different ways to keep in touch with the institution (social channels figure prominently). The design is done in such a way to enhance the presentation of the package, and not detract from it. Sunrise takes pride in crafting a box design that fits the needs of the customer. This style–a trifold–could hold a variety of things. Coins, gift cards, USBs are just the tip of the iceberg. And isn’t that what going to the university should be – just the tip of the iceberg?